Fire protection for interior and exterior environment, traditionally painted. Waterproof maintenance-free fire protection for natural aging. Woodsafe does not sell impregnated wood themselves to end customers. This is done through resellers. Shortcut to answer your questions and thoughts. 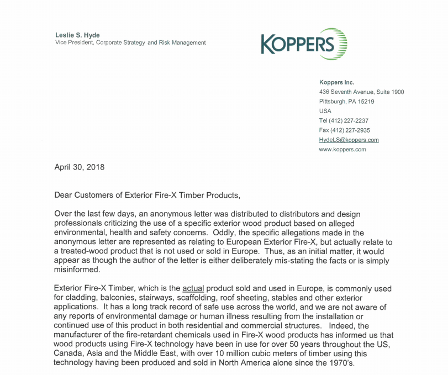 Woodsafe has come to notice that an anonymous operator in Norway is sending out misleading information to industry operators claiming that Woodsafe Exterior Fire-X/Fire Panel Nature is dangerous to handle and work with. Either way, the anonymous notifier is completely misinformed and incorrectly informed, or the purpose is to smear our partners and impersonate Woodsafe Exterior Fire-X unique features, used worldwide over more than 10 million cubic metres since the 1970s. CEO. Woodsafe Timber Protection AB. By subscribing to the Woodsafe newsletter, you will receive relevant industry information. Woodsafe ALL-IN-ONE is for those who want a simple fireproof wood solution for their construction project. Woodsafe is wood, yet not like any other wood you've encountered before, even if it feels and looks like ordinary wood. Woodsafe PRO® and Woodsafe Exterior WFX® is modified wood with improved fire performance in relation to the wood's own performance. The prerequisites for using wood in construction work increases dramatically when you choose to use Woodsafe PRO or Woodsafe Exterior WFX, which since 2008 has been certified for use in both interior and exterior applications. In our unique ALL IN ONE concept, cutting edge expertise is provided in the choice of wood, quality and expert advice on brand at product level that will facilitate your everyday work. Do you want accurate help and support from experts? We've got just what you need. Woodsafe offers a unique ALL-IN-ONE concept that consists of expert support and advice, not the praise and groundless claims that are increasingly circulating on the market. There is a great need for accurate and expert information about fireproof wood for regulatory operators such as architects, consultants, builders and entrepreneurs. When you are in need of advice or support, don't hesitate to ask. Contact Woodsafe helpdesk. There is much talk about sustainability in the media, and industries are increasingly striving for sustainability in product selection. But what is sustainability? In the Woodsafe fire protection factory, sustainability is the illumination of energy-efficient LEDs and courtyard lighting that goes out when nobody is there, our choice of electricity consists of 100% wind and hydro power, our heating of premises and wood drying works with biofuel from the immediate area, our systematic environmental work is ISO 14001 certified, our trucks are powered by environmentally friendly electricity and fuel vehicles with environmentally-friendly diesel. In our daily work, we sort waste residues for recycling, and we are proud to announce results of doubling our production volume while simultaneously reducing our resource consumption by an incredible -38%. Woodsafe fireproof wood is environmentally certified and approved, our fire protection products do not require special permits or licenses for use, content limits are below the REACH list limits, our properties have permanent fire properties and do not leak out in to nature and waterways, and our staff work under Swedish working conditions. This is our contribution to what we call sustainability. Woodsafe's impregnation is CE-certified and DoP-declared and fire-resistant properties are water resistant and durable in external environments. This ensures the safety of both the customer and us as a supplier.